This is a Guest Post brought to you by David L. Felker, PhD, the Inventor of the Polara Ultimate Straight Golf Ball. The new Polara Ultimate Straight and Ultimate Straight XS golf balls are able to correct hooks and slices by up to 75% … but I’m getting ahead of myself. Golf has been around in one shape or form in Scotland since 1457 and maybe even since 1297 in the Netherlands. 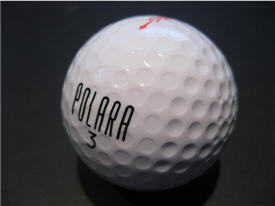 In 1976 a couple of non-golfer scientists came up with the original Polara golf ball. Its unique dimple pattern caused the ball to correct hooks and slices in flight. The company almost immediately sold 100,000 dozen balls. The USGA’s testing concluded the Polara ball did correct hooks and slices, and then promptly passed the “USGA Symmetry Rule”, making all balls like the Polara golf ball non-conforming according to the USGA Rules of Golf. This was considered to be an ufair business practice, so Polara sued the USGA. The parties settled before the trial for approximately $1.4M in favor of Polara and then Polara went away. Enter Aero-X Golf, Inc (owner of Polara Golf) and David Felker, PhD, the original VP R&D for Callaway Golf Ball Company, who was also the guy behind the Rule 35 ball in 2000 and a lot of the Callaway’s golf ball technology. After leaving Callaway, David went to work as a consultant with Aero-X Golf and worked to improve upon the Polara design. As a result, in November 2010 the new Polara Ultimate Straight golf balls were brought to market and are currently available on Polara’s website. These golf balls work so well that they come with a full money-back guarantee. The new Polara Ultimate Straight ball’s dimple design is completely different and is almost the opposite of the original Polara ball. Instead of 3 rows of deep spherical dimples on each side of the equator, the new Polara has 3 rows of shallow truncated dimples on each side of the equator. Instead of having shallow truncated dimples on the poles, the new Polara Ultimate Straight balls have deep spherical and added tiny dimples on the poles. Based on wind tunnel testing done at Princeton University, the new Polara dimple design has three types of dimples, each designed to perform a specific function and the result is a ball that now corrects up to 75% of hook and slice dispersion. The special dimple design creates a principle axis of inertia (this is the axis that the ball naturally wants to rotate about) and when rotating about this principle axis the ball generates much lower lift and drag forces. The lift force is what is responsible for the off center-line flights of slice and hook shots. Because the ball generates substantially lower lift, it is recommended that golfers tee the ball high and even use a high lofted driver – this will provide a lot of extra distance over using a low loft driver (8 or 9 degree driver) with the ball teed down low. The independent testing reveals that the Polara Ultimate Straight balls can actually correct over 80% of the off-line flight caused by some slice shots. This means if you hit a shot with a normal golf ball and it travels 100 feet off center, the new Polara Ultimate Straight ball will fly as little as 20 feet off center. The difference is like being in the fairway of the hole you are playing versus being in the adjoining fairway of the hole someone else is playing! Now, the Polara Ultimate Straight is still not approved for play in USGA sanctioned events like the US Open, but take heart, not all of us will play in the US Open or nor do all of us follow every last USGA rule. In fact there is a good argument being made by some of us who want to help grow the game of golf, that a new set of rules need to be used for recreational golfers and these rules should allow the use of equipment based on technology advances that make the game a little more fun for people. There will still be the challenges of water hazards, long puts, reading the greens, avoiding and getting out of the sand. And if someone wants more challenge from slices and hooks, they can always play a regular golf ball and even use an old persimmon wood driver. It should be up to each of us how we want to enjoy our four hours on the course. Golf is a tough game, it’s not easy to learn, it’s time consuming, has a high drop-out rate and golfers need some help. If your game includes drawing and fading the ball at will, the new Polara ball is not for you. You will not be able to draw and fade the Polara ball like the ball you are used to playing. But, if you’re that good, I still recommend you purchase a dozen Polara Ultimate Straight golf balls for this reason: Put them in your bag and the next time the foursome in front is holding up play looking for lost balls, offer them as a gift. It will improve the pace of play and everyone will enjoy that! The Polara golf ball is designed for the average golfer who has trouble with slices and hooks. I’m a 26 handicap golfer with a bad slice. I played golf a few weeks ago with a friend and using the Polara Ultimate Straight XS I hit every fairway. I never did that before! It was a lot more fun than my usual round where I lose many balls in the rough and woods. Previous post: Do You Play Golf In Wisconsin?